The Hill reported on July 9 that four of seven memos Comey wrote about his conversations with the president contained classified information. One of the seven memos was shared with a friend, who leaked the information to the media at Comey’s direction, the former FBI director has said. But despite Trump’s tweet, the Hill report — which is based on anonymous officials “familiar with the documents” — does not say whether the memo shared with the friend was among those deemed to be classified. In his testimony before Congress, Comey said that it was not. Just minutes before that accusatory tweet, the president had retweeted a “Fox & Friends” message that inaccurately claimed that “material James Comey leaked to a friend contained top secret information.” The Fox report was based on the Hill‘s story. But the Hill report doesn’t say that. Rather, it says that Comey produced seven memos about his nine conversations with Trump regarding the FBI’s investigation into Russian interference in the 2016 presidential election. “Four of the memos had markings making clear they contained information classified at the secret or confidential level, according to officials directly familiar with the matter,” the Hill reported. The report does not identify the memo leaked to a friend as among those that contained classified information, nor does it say which of the seven memos contained such information. Marc Kasowitz, the president’s personal attorney, made a similar accusation to Trump’s on June 8, when he claimed that Comey “admitted that he leaked to friends of his purported memos of those privileged communications. One of which, he testified, was classified.” But as we wrote then, Comey only admitted to sharing one memo with one friend, and that was not a document that Comey said was classified. In his Senate testimony, Comey said he had given a friend — not friends, plural — his memo — also not memos, plural — on what the president had said to him on Feb. 14 about the FBI investigation into former National Security Adviser Michael Flynn. According to Comey, Trump told him, “I hope you can see your way clear to letting this go, to letting Flynn go.” Trump has contradicted that. In the Senate hearing, Comey confirmed that at least one of the memos he created of his meetings with Trump was typed on an FBI classified laptop because the Jan. 6 briefing at Trump Tower had been classified. The Hill article said congressional investigators may now turn their attention to whether Comey may have mishandled any classified information in his personal memos, and whether the sharing of any of those memos may have violated FBI rules. But “key questions” still remain before investigators can make an assessment, the article stated. The Hill, July 9: In order to make an assessment, congressional investigators will have to tackle key questions, such as where and how the memos were created, including whether they were written on an insecure computer or notepad; where and how the memos were stored, such as inside Comey’s home, in a briefcase or on an insecure laptop; whether any memos were shown to private individuals without a security clearance and whether those memos contained any classified information; and when was it determined by the government that the memos contained classified information, before Comey took them and shared one or after. 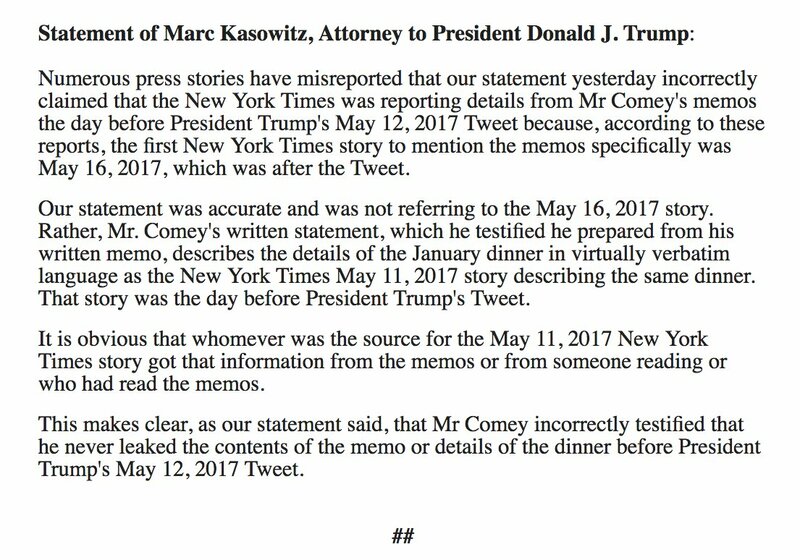 Kasowitz, Trump’s attorney, also claimed in a June 9 statement that Comey had shared contents of another memo, about a Jan. 27 dinner with the president, with the press. But Comey only admitted to asking a friend to share the Feb. 14 memo. In his tweet, the president leaps to an assumption — that Comey illegally shared classified information with the media — that is simply not established in the Hill report. We reached out to the White House press office, but it declined to provide any further evidence to back up the president’s tweet. Previous StoryDeaths from a Health Care Bill?